With SpeakPipe you can receive voice messages from your website visitors, podcast listeners or blog readers without any phone calls. Installing SpeakPipe on a website is easy and takes less than a minute. It’s a great tool for podcasters and bloggers for receiving feedback, comments, ideas, questions and testimonials. It allows you to establish a personal channel with your audience. Add SpeakPipe to your website and visitors will be able to send you voice messages from anywhere on your website by simply clicking on a button. No phone calls are required. You can use a custom button or the SpeakPipe side button. SpeakPipe also provides a hosted voicemail page, so you can receive voice messages without installing anything on your website. 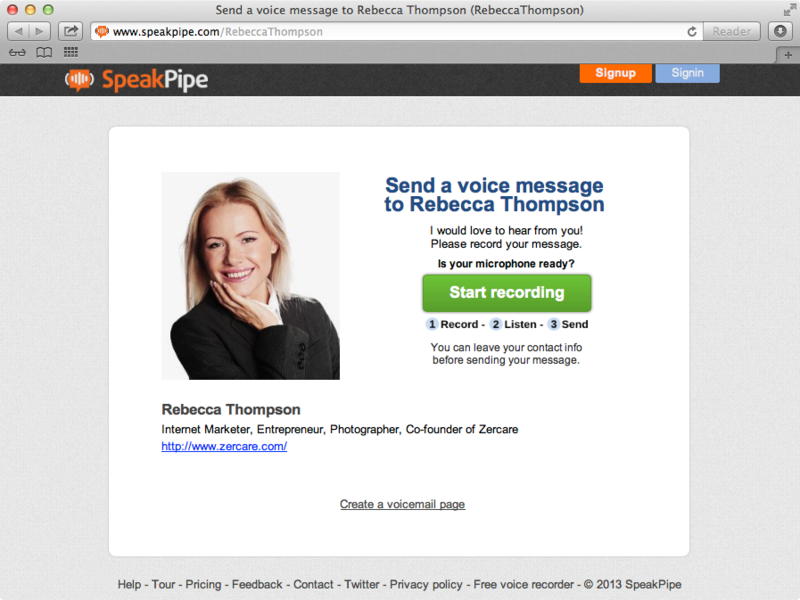 Visitors don’t need a SpeakPipe account to send you voicemail. A message can be sent with just a few clicks without typing anything. Visitors can listen to their recording before sending it. The widget allows them to record messages as many times as they want, so they can practice before sending it to you. Visitors have the option of entering their contact information before sending a message. By default these fields are optional but you can make them mandatory to make sure visitors leave their info, so you can email or call them back. You can integrate SpeakPipe with your Aweber or Mailchimp account and get new subscribers into your email list each time someone sends you a voice message through SpeakPipe. More integrations are coming soon. 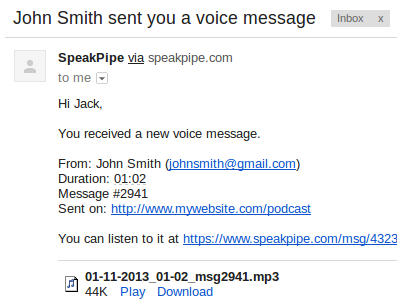 With SpeakPipe you can receive notifications about new voice messages via email. 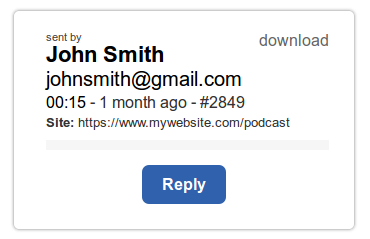 An email notification contains a private link to the message, the sender’s name and the email address and the URL of the page from where the message was sent. You can listen to the message and reply without signing into your SpeakPipe account. You can send a voice reply to a message from your audience. With SpeakPipe you can send personalized voice greetings to your readers, listeners and subscribers. It’s more engaging to receive voice messages and your audience will love to receive voice messages from you. 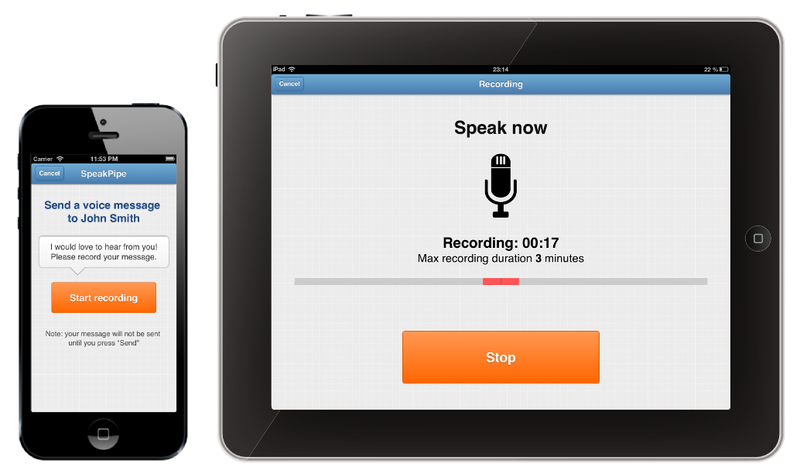 Visitors can send you voice messages from your website using the SpeakPipe app on their iPhone or iPad. Also, the SpeakPipe app allows you to listen and reply to messages on your mobile device. 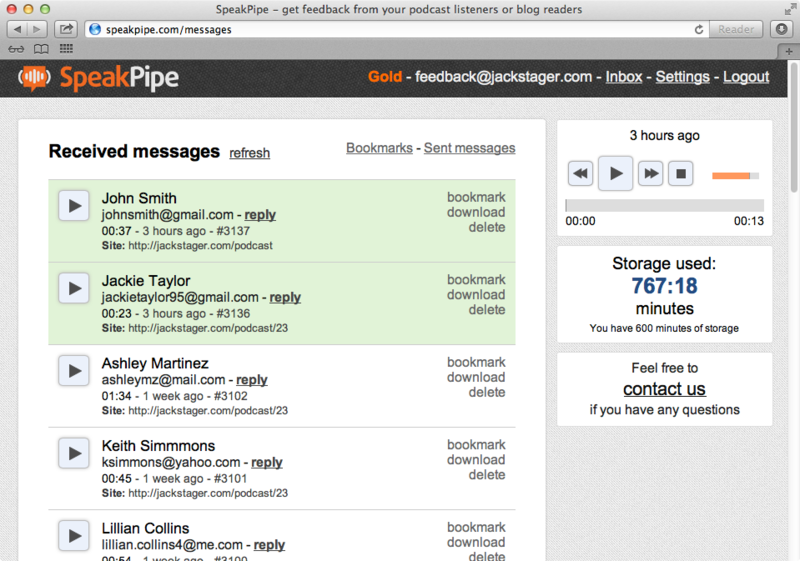 Messages are stored within your SpeakPipe account. You can access your SpeakPipe mailbox from any computer or mobile device. 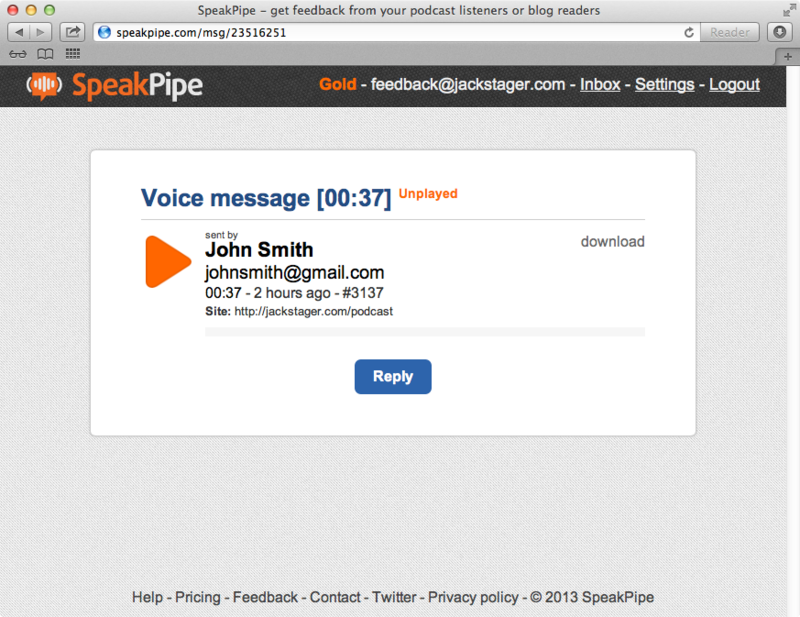 The SpeakPipe mailbox has an option to download a voice message as an MP3 file, so you can put it on your website or insert it into a podcast. Click on “Plugins” of the sidebar menu, then click “Add New” on the Plugins page. Click “Upload” and choose the downloaded plugin file. Click “Install now”. After the plugin installed, click “Activate Plugin”. Open your website’s main page and check that the SpeakPipe button appears on the middle-right side of the page. Click on it and try to send a voice message.